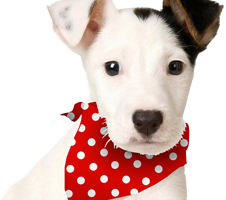 Our puppy and dog bandanas are available in three sizes. Although we have provided some guidelines about which size is generally suitable for various breeds, every dog is different so we recommended that you measure your dog’s neck before ordering. Please remember to allow a few extra centimetres to tie a knot. Not able to measure the dog? If you are buying a bandana as a gift it may not be possible for you to measure the dog’s neck. Please see our Dog Neck Size by Breed information for help and guidance. If you have a special size requirement please contact us and we’ll see if we can help. Our dog bandanas do not have any buckles or fasteners. They are easy to fit and adjustable. Simply tie the bandana around your dog’s neck to fit. If you find the bandana is a little too large it can be adjusted by folding the top edge before tying. Our dog ties and dickie bows have a small hook fastener and adjuster. We have two sizes of dog bow ties, standard and large. Unless otherwise stated in the product title and description the bow tie will be standard size. All measurements are also included in the product description. For standard dickie bows the maximum neck measurement is approximately 42cms and the bow width is 9cms. For large dickie bows the minimum neck measurement is approximately 24cms and the maximum is 48cms. The bow width measures 12cms. We recommend you measure your dog’s neck before ordering. Important: For all dog ties, dickie bows and dog bandanas please see Information on Your Dog’s Safety.